This article originally appeared on the LSE Impact Blog. Reproduced with permission. Solution-oriented social science makes solving problems the object of social science, and working on other people’s problems becomes the key driver of the problems to be solved. These solutions may be of relevance for everyday citizens or actors working in government, non-profits, or for-profits. Mark Western argues that approaching research in this way would influence how we choose problems, how we build teams and collaborate, and what methods, tools and techniques we employ. One of the great strengths of the social sciences is their ability to systematically identify and analyse problems. In doing this they help us understand and explain the world. Outside social science, though, people are often more interested in solutions than problems. Understanding a problem is just the first step to finding a solution. I believe social scientists need to recognise that problem-oriented social science needs to be complemented by more solution-oriented social science. By solution-oriented social science I mean social science that produces meaningful solutions – knowledge, services and products – for others, while also advancing our scholarly fields. If we focus more extensively on solution-oriented social science, we will increase the reach of the social sciences, and we will create social science that is exciting, meaningful and transformative. Social scientists understandably want to work on problems that interest us and matter in our disciplines. This, indeed, is the standard advice many of us give our graduate students. But focusing only on problems that matter in a disciplinary framework is a sure-fire way to limit our reach. In contrast, choosing problems that matter to others (other disciplines, other sectors like government or industry) expands our influence. And by working on other people’s problems in ways that are useful them, we are steered towards solutions – knowledge, services and products – that will benefit those whose problems we work on. But benefits from working on other people’s problems flow both ways. It’s invigorating to use social science expertise to think about questions we are not used to thinking about. It’s also one way to produce new insights and overcome the myopia that comes from only using a disciplinary lens. Disciplines like statistics (Stigler 1986) and bioengineering (Taylor 2013) emerged and developed as attempts to engage with and solve so-called applied problems. Engaging with problems that matter in the world beyond our disciplinary journals is one way to revitalise disciplinary growth. Likewise, seeing questions as others see them can help fundamentally reorient our own social sciences. Social problems like homelessness and inequality are not just academic questions, requiring description, explanation, and understanding. They are policy challenges requiring effective solutions. They are moral challenges that go to the heart of what it means as humans to live and flourish in the world. Bringing a policy or moral lens to a social issue immediately switches the frame of reference from academic description, explanation and understanding to solving a problem, or providing evidence that will help solve a problem. With this shift in perspective, social science becomes more relevant and useful to others and more meaningful to many of us. What are bigger problems? I don’t have a well-ordered conceptual answer, but I do have indicators. First, bigger problems are problems that lots of constituencies are interested in – multiple disciplines, governments, not-for-profit and for-profit organisations, citizens. Addressing big problems can provide a solution to one or more of these constituencies. Second, big problems have big social, economic, political and environmental consequences. Solving big problems may bring big benefits, or help avoid big problems and costs. Working on big problems often means accepting others’ research agendas, particularly if the others are governments, national or international organisations, major corporations, industries or not-for-profits. Working on bigger problems also means scaling up teams, data, and infrastructure. Big problems will frequently have multiple parts, and those parts will require different approaches, different resources and different expertise. Having bigger teams does not simply mean including more disciplines. If we are working on external research agendas, we will frequently be working with others — government organisations, industry groups, not-for-profits and community organisations, international agencies and organisations — to co-design problems and solutions. Non-university stakeholders bring essential resources, such as deep program and policy knowledge, data and data knowledge, networks and connections, different perspectives, an understanding of economic, political and institutional constraints and possibilities, that help ensure that new solutions to big problems work where they are supposed to work. Solution-oriented social science makes solving problems the object of social science, and working on other people’s problems becomes the key driver of the problems to be solved. This requires a new way of thinking about research. 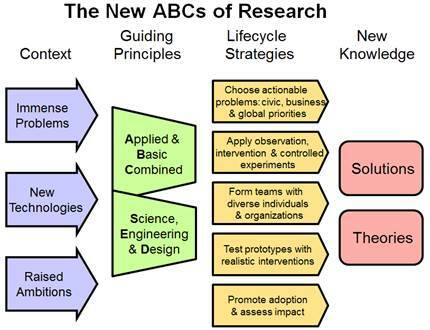 One very insightful model is provided by Ben Shneiderman (2016) in The New ABCs of Research: Achieving Breakthrough Collaborations. Shneiderman’s framework is informed by science disciplines, but his arguments apply equally to solution-oriented social science. As the research context changes, responding to big problems requires research approaches that combine science (including social science), engineering, and design principles. Science and social science provide understanding, description and explanation. Engineering helps develop solutions for known problems. Design brings different stakeholders together to identify requirements that help clarify new problems and new possibilities (Shneiderman 2016). Approaching research in this way influences how we choose problems, how we build teams and collaborate, and what methods, tools and techniques we employ. This kind of research also elides the distinction between basic and applied work; in producing solutions we also produce new knowledge that advances theory. Projects that follow the full life-cycle from co-designing questions and problems, to developing, testing and implementing scaled solutions, will invariably use a range of different kinds of theories, methods, data and research designs. No single theory, method or approach adequately covers the full project lifecycle. Decontextualised debates on theory and method lose relevance in this framework, although debates that are linked to addressing problems at each stage of the project life-cycle remain important. 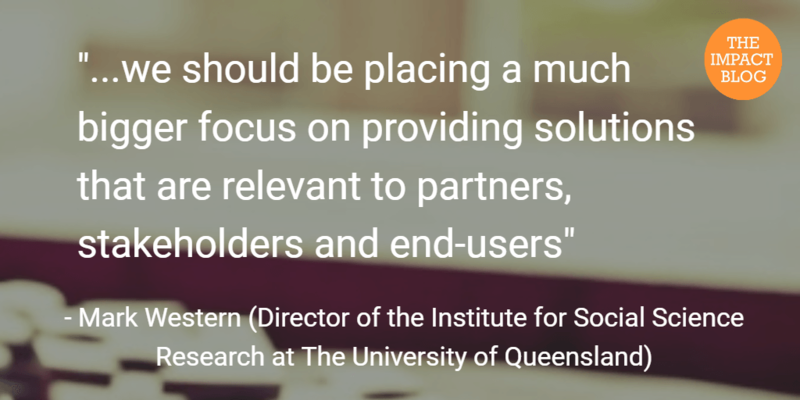 Solution-oriented social science puts collaboration and team-building at the heart of research. We collaborate, frequently beyond universities, to identify problems and required solutions and we build teams to encompass elements of the project lifecycle. Thinking about Shneiderman’s life-cycle strategies also implies thinking about team building in new ways. For many of us, team-building involves working with other people like ourselves. Even multi-disciplinary collaboration frequently involves only collaboration among social scientists from different disciplines. While this enables us to bring different disciplinary lenses to a research question, thinking in terms of Shneiderman’s project life-cycle implies that we should build teams around different interdependent functional capabilities. Rather than bringing different disciplines to look at the same part of the problem we should build teams to handle different parts of the research objective. Some team-members may deal with the core science and social science, some may have data or policy expertise, others have project management skills, others are responsible for intervention development and evaluation, and so on. A team in this framework is more akin to the team you would assemble for a major design, engineering and construction project than the research teams many of us are familiar with. Solution-oriented social science is already occurring. Much of what we commonly think of as “applied social science” is trying to provide particular solutions to particular questions. But I think as social scientists we should be placing a much bigger focus on providing solutions that are relevant to partners, stakeholders and end-users, and I think we should also be more ambitious in the questions we tackle and our aspirations for our work. If we can create a virtuous circle of research addressing high impact questions in ways that generate useful knowledge, products and services, while also advancing our fields, we will strengthen the social sciences and create public value (Brewer 2013) at the same time. Thanks to Brian Head and Cameron Parsell for helpful comments and Ben Shneiderman for permission to reproduce the figure from the The New ABCs of Research: Achieving Breakthrough Collaborations. Mark Western is the Director of the Institute for Social Science Research (ISSR) at The University of Queensland, Australia. ISSR undertakes solution-oriented social science with partners and stakeholders in the public, private and not-for-profit sectors. Mark has worked on a number of projects with academic and non-academic partners and published on topics relating to social and economic inequality and mobility, political behaviour, and applied statistics. He recently served as one of two Deputy Chairs of the Expert Working Group that reviewed Australia’s Research Training System for the Australian Council of Learned Academies and the Minister for Education and Training.